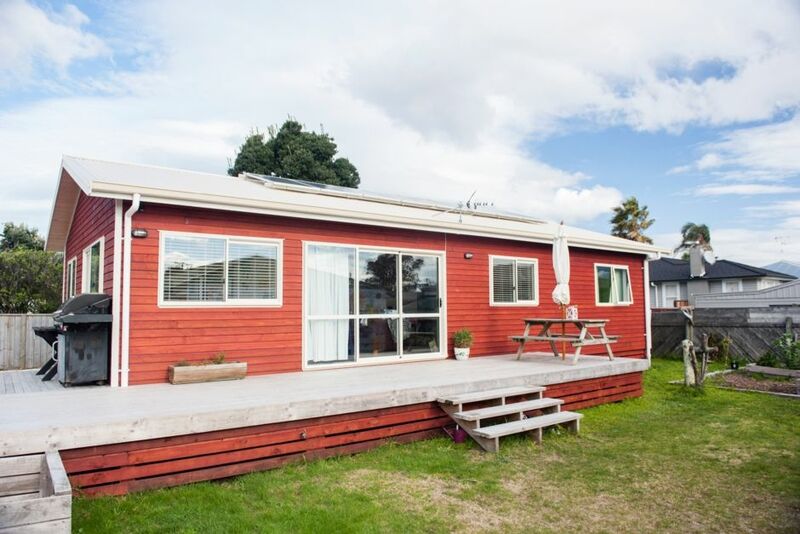 Enjoy a stay in this light and airy wooden home, so close to the beach! With its high ceilings and white washed wooden interior it feels very spacious and cozy at the same time. The open living area opens up to a large deck with bbq and outdoor furniture. In front of the deck there is plenty of fun for kids with trampoline, swing and monkey-bars. You could easily spend your holidays without a car here. You can walk to beach and shopping and on a rainy day there is indoor swimming and gym ten minutes walk away. There are plenty of buses nearby to Tauranga, Mount city centre and Papamoa. On a bike you can get to Mount city centre in twenty or to Tauranga CBD via the green hills of Matapihi island in half an hour. Deck not suitable for very small children. I'm a single woman in my late 40's. I come from Sweden and have lived in New Zealand for more than ten years. I've got two lovely kids, 8 and 10 years old, who stay with me week on week off. I work part time as an English teacher at a language school just around the corner. I also teach Swedish to a group of Swedish kids once a week. I enjoy the outdoors and to socialize with my children and friends. I work quite a lot from home, mainly preparing classes. I chose to build here because I like the area, close to the beach and still close to both Mount Maunganui and Tauranga city centre. I wanted a wooden house because I think it's nice and cozy. Close to shopping. Only ten minutes walk to the region's most popular shopping center. One bathroom with toilet, shower over bath and basin. One separate toilet with basin. Five minutes walk to long sandy surf- and swim friendly beach. A heat pump in the living room and electric panel heaters in two of the bedrooms. Only space for one car on the driveway as it is shared with the neighbour. Additional cars need to park on the street. Open lounge with two arm chairs, one sofa bed and a couple of bean bags. Hidden in the pantry and power switch at the back! An espresso stove top coffee maker, a peculator and a plunger available. Table with two extension boards available. Can sit up to ten. 10 chairs in the house. Just a couple of speakers you can connect your device to. There is a little lawn in front of the house with monkey bars and a swing. There is also a basketball hoop by the drive way. Because of stairs to get up on deck to front doors. We really enjoyed our stay; great location, just 5 minutes to the beach and a short trip to the Mount. The house had everything we required and it was exactly what we needed for some R & R before returning to work. This lovely home was perfect for our family. Was very clean and had everything we needed. Nice quiet location but still handy to everything. Would definitely stay there again. Thanks for letting us stay Gisela. Loved the bach, it was so close to the beach and so beautiful as well. We really enjoyed our stay in this place, well set up with all that we needed. We really enjoyed our stay in this place, well set up with all that we needed. thank you. The bach was perfect for our stay and such a great location! Ten minutes walk to shopping center and indoor swimming pool. Ten minutes drive to Mount Maunganui and Mount Hotpools. Twenty minutes drive to beautiful waterfalls (Kaiate falls and MacLaren Falls) and glow worm trail (also Mac Laren Falls).